The Freewind is built on an Iveco cab chassis, powered by an 180hp (130kW) four-cylinder diesel turbo motor with a six-speed auto/manual gearbox. It has bags of power, as I discovered on the run up to the Lyttleton tunnel. From crossing the bridge at the Heathcote turnoff at 70kph, it flew to 100kph very nimbly, and felt it had plenty of power and speed in reserve. 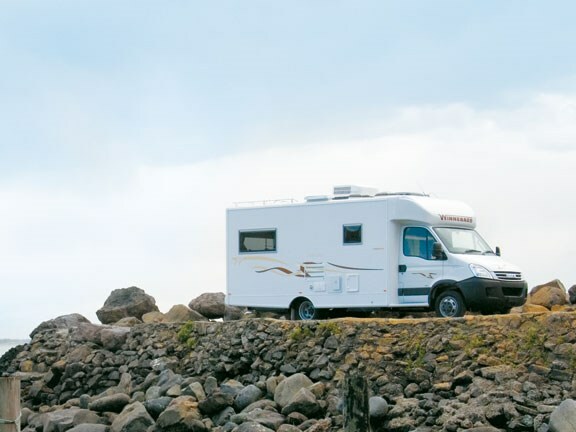 The vehicle reviewed was fitted with a towbar rated for 3.5 tonnes, the maximum the Freewind can tow legally, and it gave the impression that it would manage that. It took a few moments to adjust to using the MTA (manual transmission-automated) gearbox. It offers the option of manual mode or full automatic, and you can switch modes by nudging the selector stick to the left. If you have opted to move off selecting gears manually but get bored with the effort after a couple of changes, just nudge the selector to the left and the gearbox takes over in automatic mode quite seamlessly. You can do this going downhill too, allowing the gearbox to remain in any gear you choose. Very handy. The handling is light and predictable with little body sway, but you do need to remain aware of the width of the vehicle. It is around 200mm wider each side than the rear wheel track, with a total width of 2490mm including the awning. The cab is well appointed, with air-conditioning and a CD player radio, plenty of storage pockets and airbags for driver and passenger. The first impression I had on entering the motorhome was one of space. The coach body on the Freewind is built close to the maximum width the law allows. 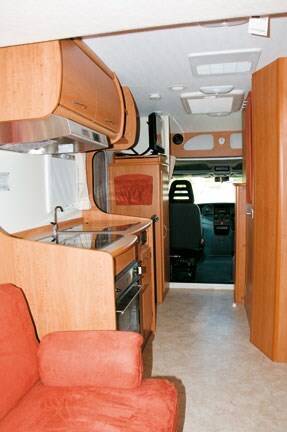 The wide body gives extra room to move around and the layout arrangement emphasises that first impression. 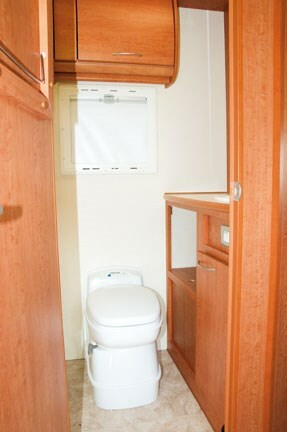 The bathroom is located behind the driver’s seat, with the fridge/freezer unit beside it. The entrance door is right behind the passenger seat. The kitchen bench is aft of the door. The large lounge is at the rear and is furnished with two armchairs and a settee, which converts into a small double/large single bed. Because of the bed arrangement there are no overhead side lockers. Instead, there is a very smart fabric- covered pelmet each side, inset with down lights and backed discreetly with wall mirrors. It gives an illusion of depth and space and adds a tastefully modern ambience to the lounge. It is a cosy setting and a convenient one too, as there is a small table for two, housed in an inconspicuous cabinet mounted on the wall. A much larger table, stored in the wardrobe, can be set up on twin floor- mounted legs for larger groups. 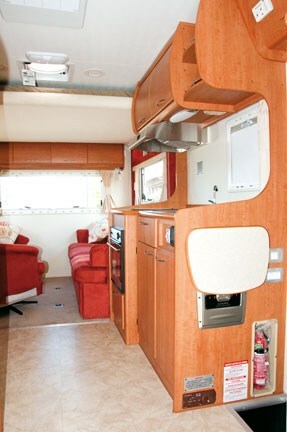 However, the feature that sets this motorhome apart from most others is the double bed. When not in use, the large double bed (2000mm long x 1550mm wide) is stored up against the roof and the underside of the bed forms the lounge ceiling. At bedtime, a push of a button and the bed is lowered into position on a cunningly concealed chain mechanism that raises and lowers the bed, as well as holding it in any intermediate position you might choose. In the completely lowered position, the bed is around hip height, so stepping onto a small stool makes getting into bed easier. If you wish to use the lounge seating and the bed at the same time it is quite practical to lower the bed partway. Should one bed partner prefer to rise earlier or retire later, the lounge can still be used by the other to enjoy reading their book or to have a cup of tea. It is a very practical arrangement that allows dual use of the bedroom/lounge space, providing a made up double bed to be available most of the time, while reducing the length of the RV by around a metre. Cooking requirements are well catered for. There is a Dometic three-burner hob beneath a Jensen range hood, which exhausts through an outside vent, and a Spinflo Duplex oven with griller. Alongside the hob is the stainless steel sink, and both the hob and the sink have glass covers that, along with the lift-up bench extension, increase the working area of the bench top. A filtered drinking water tap is mounted on the bench top. The Dometic three-way, 150-litre fridge/freezer and LG microwave are handily placed, facing the bench. Storage includes a dedicated cutlery drawer, wire basket drawers and a pots and pans drawer. The convenient layout and attention to detail make this one of the most user-friendly kitchen spaces I have reviewed in an RV. I was more aware of various notices giving instructions on how to use equipment displayed on the walls than I have been on previous RV reviews. These are displayed to meet with Australian codes of compliance aimed at avoiding dangerous situations arising through incorrect use of equipment. The one that appealed to me clearly set out the tare weight, the maximum permissible axle and total weights, and provided easily understood definitions of all the terms of bureaucracy like GVM and GVC. Such information is invaluable as it gives buyers clear advice about what the Freewind can and cannot carry, allowing them to make better informed decisions. 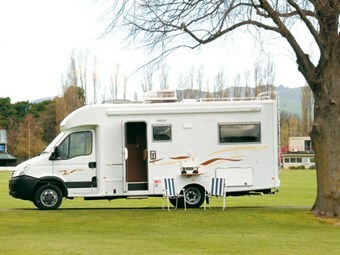 Winnebago recognises we use our RVs as bases for outdoor activities, whatever the weather. It fitted a bar above the shower in the Freeway, converting it to a hanging locker for wet garments. The separate shower is of generous dimensions. There is a hatch above the shower, another above the adjacent Thetford C200 toilet and an opening window, ensuring adequate ventilation to get and keep things dry. The handbasin and vanity are sensibly sized, and the mirror over the vanity has a four-globe fitting to reveal all to those who demand that degree of scrutiny. There is a shelved overhead locker as well as shelves and a locker beneath the handbasin for storage. I liked the innovative towel rails on the inside of the bathroom door. The rails lie flat on the door but pull out to allow towels to hang on them. Another good idea is mounting the clothes hooks on the outside of the door where they remain safe and dry until needed. There are some nice creative touches that provide continuity to the interior colour scheme: the fabric storage pocket above the entrance steps, the fabric panels on the bathroom door. Practical things too, like the fire extinguisher mounted in a moulded housing mounted by the entrance, and the sliding shelf with the LCD TV mounted on a turntable to allow viewing from the lounge and kitchen. 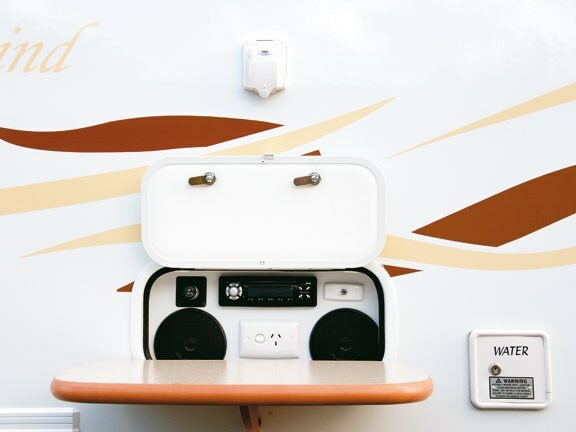 Just above the fire extinguisher is the base station for the set of four walkie-talkie radios that are a regular but exclusive feature of Winnebago RVs. All windows are double glazed acrylic and have built-in blinds and insect screens. Outside the vehicle are other amenities that are becoming hallmarks of Winnebago. The radio/CD player with twin speakers in a housing that includes a 12-volt and 230-volt power points, a mains pressure water connection, an outside shower, a ladder to access the roof and roof rack that are both strong enough to walk on and lash gear to, and a large externally accessed locker. 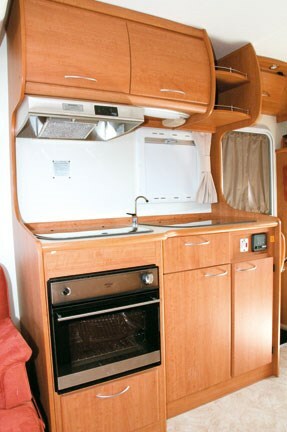 The exterior of this Freewind is white with autumn tones of gold and brown decorating the sides. There are two other layouts in the Freewind range. 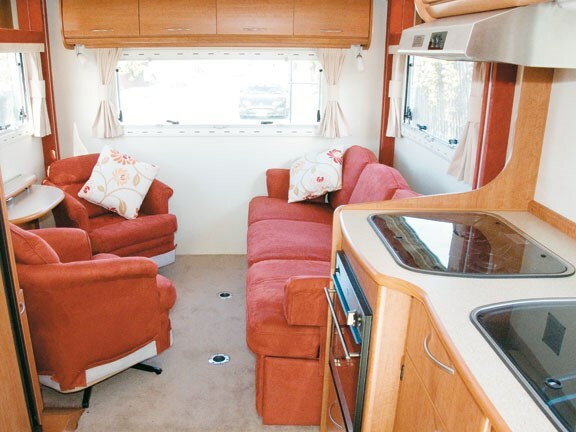 One, the same length as the model reviewed, has slide-out in the lounge, which allows for room for a permanent double bed at the rear of the RV. 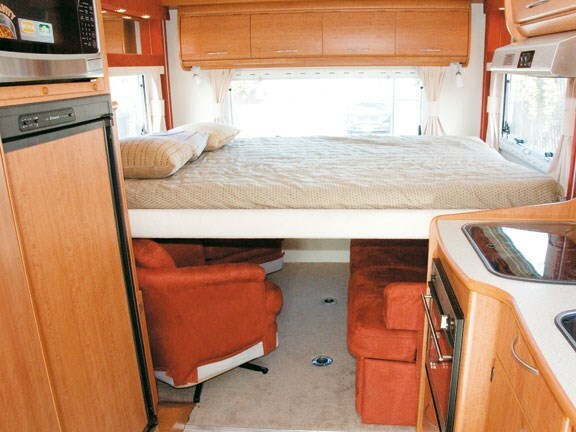 The other layout is a metre longer at 7.4 metres, with a permanent east/west double bed in the rear. This Freewind has the most innovative layout of the three on offer, and worth serious consideration by buyers needing a large double bed in an 7m long RV.